Learn basic German language conversational skills. 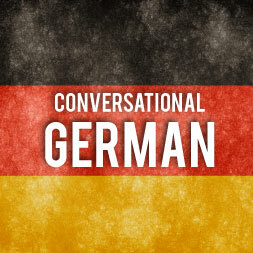 Conversational German – First Contact is a course which is designed for anyone who wants to learn to speak basic German. The course is broken down into pronunciation of the alphabet, numbers and words and the basics of conversation covering hello, goodbye and introductions. Audio segments will let you hear the sound of each letter in German, as well as how the various letters are pronounced in words. The course lays down the foundations of the spoken language by introducing learners to the pronunciation of words and phrases through text and audio. Short audio segments let you hear how the words and phrases are pronounced. You will learn how to greet people and address them correctly, both formally and informally, with multiple examples for listening to. You will learn how a sentence is formed in German and become familiar with basic grammar. This course will be of great interest to anyone who wants to learn to speak German for use in business or social occasions, and for those wanting to travel to any German speaking country or region in Europe. Having completed this course you will be able to: - Pronounce the letters in the German alphabet; - State the basic numbers - Ask for the spelling or pronunciation of words or names; - Construct a sentence correctly in German; - Write a simple letter or e-mail; - Say 'Good morning' and 'Good evening' – both formal and informal; - Ask how somebody is and reply in kind; - Address people correctly; - Introduce yourself and reply to an introduction; - and introduce someone. It is a wonderful course. It helped me greatly.I instantly recommend it to everybody who begins to study German. Very good course! Introduces you to the real basic German! Now I want to practice more to achieve my new goal, the full German course!